Measure Each String Picture to the Nearest Inch. Measure each shape using the ruler shown; Measure to the nearest half inch. Measure each picture to the nearest half inch. using the given ruler. State the length of each line segment to the nearest half inch. Measure each line to the nearest half inch. Practice counting by halves. Helps students learn to read rulers to the nearest half inch. Measure each object using the ruler shown; Measure to the nearest quarter inch. Measure each item using the ruler shown to the nearest quarter inch. State the length of each line segment to the nearest quarter inch. Practice counting by quarters. 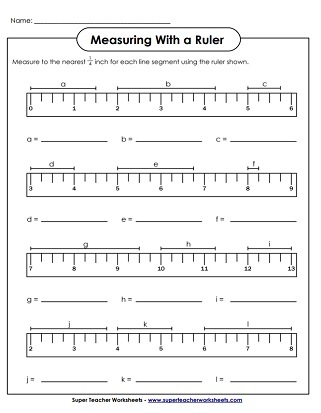 Helps students learn to read rulers to the nearest quarter inch. Measure each item using the graphic ruler; Measure to the nearest eighth inch. Measure each item to the nearest eighth inch. State the length of each line segment to the nearest eighth inch. Here's a picture of a ruler with fractional measurements labeled. Practice counting by eighths. Fill in the missing numbers for each sequence. A take-home project that requires students to accurately measure friends or family members. Complete the table and answer the standard measurement word problems. Complete the table and find equivalent measurements. Set of four measurement bookmarks for reference. Includes linear measurement (standard and metric) and capacity. Use the "greater than" and "less than" symbols to compare measurements in feet and inches. Determine which measurement is not equivalent to the other two. In-and-out boxes for converting yards, feet, and inches; includes word problems. Measurement learning center that's easy to set up. Metric measurement with a ruler; Measure objects to the nearest centimeter or millimeter. Measuring volume with gallons, quarts, pints, and cup. Worksheets with in-out boxes at different levels.